“It was a hornet’s nest that initiated my journey into the world of insects,”1 says Geetha Iyer in describing her many encounters with hornets that opened, to her, a new window into the world of insects. She shares her narrow escape, unscathed, after being surrounded by a swarm of angry hornets2 in a new book on insects, “The Weavers: The Curious World of Insects”. Ordinarily, one would assume that incidents such as these would likely have people stay away from hornets. Not Geetha. She proceeds to share her own detailed observations of the nest-building activities of hornets and in the process, introduces us to silk, the material that serves as the leitmotif of this book, and its role in the pupation of hornet larvae.3 In this book, Geetha combines the narrative natural history approach pioneered by Fabre4 with the adroit use of the metaphor and theme of silk to weave together a rich fabric of insect evolutionary history, insect biochemistry, insect behaviour, insect development and insect taxonomy (classification). We are shown the intricacies of the lives of familiar insects such as hornets, wasps, bees, ants, preying mantids and moths, and strange ones whose names you might probably hear for the first time, such as web-spinners and owl flies. Detail of this kind is nowhere burdensome or distracting since the style is direct, and technical terms are explained when introduced (hemimatabolous – insects that reproduce and grown through incomplete metamorphosis, or repagula – unfertilized eggs, from the Latin repagulum or barrier), doing away with the need for a glossary. In fact this detailed approach is a strength of the book, as it effectively opens up the wondrous world of new insects to the uninitiated. How many of us knew that silk is a good candidate to explain the diversification of caddisflies to occupy different habitats?8 Or that Tussar silk has “potential in…cardiac therapy as scaffolds to regenerate cardiac tissue”?9 There is even a lesson on the energy cost of silk production!10 The information presented in each section allows the reader to get a good feel for the content of the book, but never so much that you drown in excessive detail – you are soon presented with another section that has its own set of surprises in store. Information boxes are used to present material related to the narrative, interesting as standalone facts (p. 76), or as tidbits (p. 157) or anecdotes. A book of this kind that tells so many stories of the natural world is enhanced by 16 colour plates with photographs, many of them taken by Geetha herself, representing a wide range of the insects discussed in the book. These well-produced photographs help the reader to imagine the lives of these insects, and can serve as a field guide to them as well! The photographs might also cause some of us to recoil at the sight of insects, and Geetha has a few words for us there as well, “it is ironical that so many of us hate insects, yet spend thousands of rupees willingly to drape ourselves in what is primarily insect saliva!”16 I highly recommend this book to anyone who might be curious about insects, and especially to the ‘insect haters’ among you, who could perhaps look at it as a travel guide to the Antopolises and Cocoonpurams of this most diverse group of organisms in our world – to boldly go to places where no insect hater has gone before! At Rs. 399, this is perhaps the most reasonably-priced ticket you might get to go there! Iyer, G. (2016) The Weavers: The Curious World of Insects. Harper Collins. p. 66.
de Mattos., A. T. (Trans.) (1991). The Insect World of J. Henri Fabre. Beacon Press. 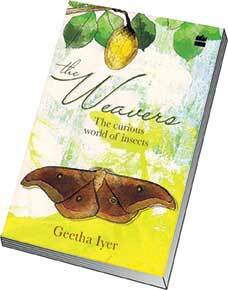 Iyer, G. (2016) The Weavers: The Curious World of Insects. Harper Collins. p. 1-9. Iyer, G. (2016) The Weavers: The Curious World of Insects. Harper Collins. p. 126. Thomas, R., & Iyer, G. (2009). Satpada. Our World of Insects. Rishi Valley Education Centre. de Mattos., A. T. (Trans.) (1991). The Insect World of J. Henri Fabre. Beacon Press. p. 68-74. Iyer, G. (2016) The Weavers: The Curious World of Insects. Harper Collins. The author is a part of Centre for Learning, an alternative school located near Bangalore. He teaches biology, statistics and chemistry to senior students and is closely involved in the school’s nature education and library programmes. He can be reached at dumaketu@gmail.com.